Aside from the convenience and economic benefits that they provide, digital cameras can be a valuable starting point for learning the intricacies of photography. Getting to grips with a ‘point-and-shoot’ digital camera is remarkably easy, but it also serves as a good spring-board for investigating the more complex areas of manual photography, and possibly eventually moving on to an SLR. Pre-set modes can be a valuable tool in this learning process. Every digital camera has a selection of different ‘modes’. The purpose of these modes is to ensure that the different variables on the camera (aperture, shutter speed etc) are correctly set to produce an optimum image. Modes can be grouped into three different categories: fully automatic; semi automatic; and fully manual. Your choice of category and mode will depend on your own experience and know-how, as well as the circumstances in which you are shooting. We will look at automatic modes first. Automatic modes mean that the camera itself will determine the correct setting for each of the variables, taking control completely out of the hands of the user. All you will be required to do is frame the shot, and perhaps focus. Every digital camera will have a basic automatic mode in which the camera will try to ensure that a good exposure is produced. However, this mode tends to produce sub-optimal results as the camera has no idea of what type of photograph you are attempting to take. In order to combat this problem you should investigate ‘specialised’ automatic modes. Perhaps the most common of these is the portrait setting. In this mode the camera will automatically alter the aperture to ensure that the background is thrown out of focus, creating a classic portrait look. Another particularly useful automatic mode is the night mode. This is designed for use in low-light environments, and means that the shutter speed will be reduced, the aperture opened and the ISO setting increased (for more information on all of these terms you may wish to read the relevant articles elsewhere on this site). It should be remembered, however, that as the shutter speed is reduced a steady hand is necessary in order to avoid blurred images. Semi-automatic modes are an even more useful tool for learning how to use the camera’s variables yourself. Each of these modes are known as ‘priorities’; thus, there will be a shutter speed and an aperture priority. 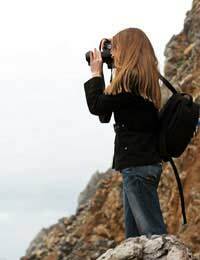 In shutter speed priority mode, the user takes responsibility for setting the length of time for which the shutter is open, while the opposite is true for aperture priority. The camera takes control of all other variables, meaning that you can experiment with the results of different settings. Finally, higher-end cameras will offer a fully manual setting. In this mode the user takes responsibility for all of the variables: shutter speed, aperture, ISO and so on. Having experimented with semi-automatic modes you may wish to move on to fully manual in order to create the precise image that you would like to see. While this may appear complicated initially, the freedom that this mode offers is certainly worth the learning curve if you wish to produce individual, unique images.